After teaching art with the Dubuque, IA public school system, Toby moved to the Kansas City area in 1987 and established SageBrush Exchange as an Art studio. Workshops were offered on her land incorporating art with Shamanic practices while exploring Native American and Incan Medicine Wheel teachings. With the installation of "The Prairie Labyrinth" in 1995, her art expanded to the energetic field, focusing on the land in sacred reciprocity with balancing mind, body and spirit. Her involvement with "soul retrievals" (A Shamanic practice of reclaiming pieces of self from past traumatic events) prompted her to begin hypnotherapy training in 2000. She is certified with Dr. Brian Weiss and Dolores Canon as a Past Life Regressionist and with The Newton Institute as an (LBL) Life Between Lives Spiritual Regressionist. 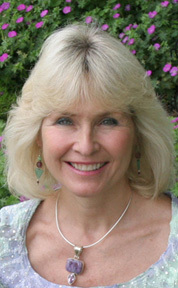 She is a founding member of the international organization "The Labyrinth Society" and "The Art Line Project" and author of "Chakra Labyrinth Cards", "Keeper of the Circles; Answering Your Call to Wholeness". Toby is available for speaking engagements and transpersonal workshops. Energy Medecine - Tracing your Meridians.